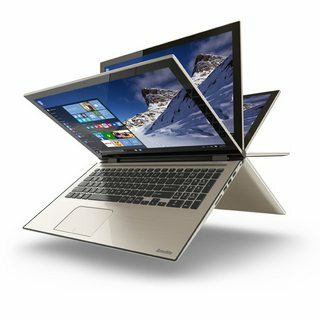 The Satellite Fusion 15 L55W-C5259 is a brand new, Windows 10 ready, mid-range convertible laptop from Toshiba. Officially launched just a few days ago, it comes at a list price of $799, a fair price for this laptop with hinges capable of rotating the screen at 360 degrees. It’s ideal for college students, home users and light work (more useful in face-to-face and small team presentations and meetings). 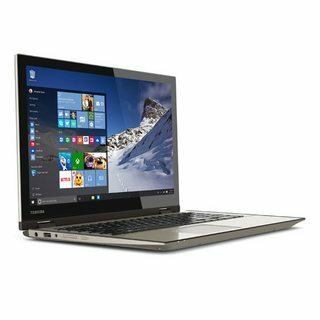 The Toshiba Satellite Fusion 15 L55W-C5259 comes standard with a dual core Intel Core i5-5200U processor, with 3 MB of available cache, a very respectable 5th generation Intel processor that’s the ideal mix between a low price and good performance. We’d even say it’s the best processor for light tasks with bursts of heavy multitasking, which is what this laptop is designed to do beautifully. It also has 8GB of available system memory, enough for running a host of apps and software simultaneously. Storage space, however is limited: only 128 GB available, but comes with the benefit of having the new M.2 generation Solid State Drive (the successor of the small mSATA drives), which is small, energy efficient and boast high speed access to your files, data and programs. This CPU-RAM-SSD combo will guarantee boot times in seconds, improved software responsiveness (no matter the software) and a more fluid user experience. Getting some storage space on cloud services such as Google Drive or Dropbox is recommended with such a small storage capacity. The thing that makes this laptop special and really differentiates it from the crowd is the full HD IPS touchscreen that rotates completely. You can use it as a standard laptop in the traditional configuration, as a collaboration device by tilting the screen to 180 degrees, as a presentation screen by setting the laptop as a tent or as a tablet by completely rotating the screen. Toshiba also added extra functionality to it by automatically locking up the keyboard when in tablet mode to prevent accidental typing. 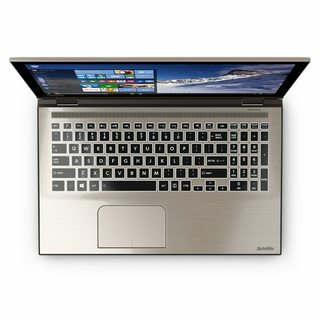 Other nice features include the beautifully designed, frameless LED backlit keyboard, 802.11ac Wireless technology, 4K HDMI output, 2 USB 3.0 ports out of which one is capable of Sleep and Charge function and of course, the new Windows 10 complete with Cortana and Edge, the successor of Internet Explorer. It doesn’t have a dedicated video card and it doesn’t need to for the purposes it’s been designed. You can easily do every task you can think of with this convertible laptop except play the newest games and do heavy graphics demanding work (such as 3D rendering). For every day use, the Toshiba Fusion 15 L55W-C5259 is great blend of portability, functionality and performance, not to mention the great price it comes at. 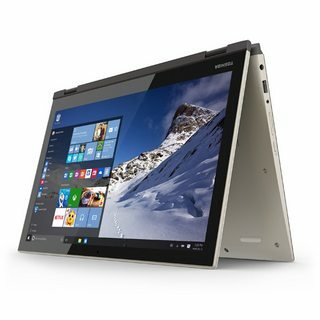 There aren’t many legitimate cons to buying the Toshiba Satellite Fusion 15 L55W-C5259 if you’re preparing for college or just want a laptop to successfully act as a work station, a screen for your favorite TV series or as a tablet. We suggest it for students, for home users and business professionals who have to do a lot of presentations.